Personalized soup mug serves personality! Print name. Holds up to 22 oz..
Mugs will make a great christmas gifts for people I work with and eat lunch together. Friends ask where I found them! Everybody knows whose bowl to grab for seconds! This is the second one I bought. It's great for soup and extra large cups of hot cocoa. I'm glad someone carried a huge 22oz coffee cup. [...] Thank yo so much! Bought these mugs with the 2 Latte Mugs. Gave them as gifts at a Bridal Shower. Personalized color and name made it special. Makes a great gift for any occasion. Love these beautiful sturdy cups! These cups are beautiful and sturdy. I bought some for everyday use at first, and then came back to buy them as gifts for family and friends. Very nice! I like it a lot. I've been wanting this for a very long time. The deal was sealed when I got a check to apply to my purchase. Thank you. In the last few years I have purchased more than 25 of these soup mugs. Not all at the same time. They are great, not only can you use them for soup, but chili, cereal, ice cream etc. The handle makes it easy to hold. Dishwasher safe and letter stays on. They make great gifts. It is a perfect addition to begin a new household with my new wife. Beautiful gift for any occasions and reasonable priced. Cups and bowels are great ! Loved by kids and grownups! We were surprised by the overall quality of these mugs! It is exactly what my friend wanted for Christmas and I couldn't find it anywhere in Canada. The shipping was quite a bit but it arrived safe and fast. So excited to give it to him. Bought these for gifts, pleased with quality. LOVE THIS FOR MY GRANDKIDS WHEN THEY COME OVER. LOVE THIS WHEN MY GRANDKIDS COME OVER INSTEAD OF USING MY BIGGER BOWLS. We love these mugs, the personalization makes it sentimental, the size is great for soup, ice cream, I've even used it for hot chocolate! I ordered over 20 mugs and cups they all are very nice and hand written.. Checked each one that was ordered to make sure the names where right and they was!! Have to start on the christmas shopping. I love these personalized coffee mugs. The fonts are great. Holds a lot of coffee & coco. 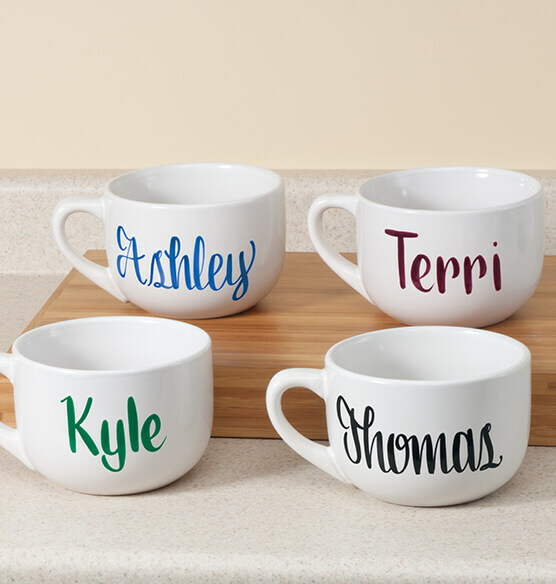 I have always wanted to have a personalized soup mug (I have two first names) and one son has a differently spelled name as does one niece, etc., so these are perfect! My biggest problem was that I should have gotten free shipping and I did not. I was told they would wait until my order was ready for delivery and they would deduct the shipping, they did not. So, these great gifts for a great price ended up costing me $10.99 in shipping. I bought these for my grandchildren. My kids had the same ones but without the handles, I bought those 20 years ago, they still have them. The grandkids were jealous so I got them some too!! I bought a soup bowl for my daughter with her name on it and she loved it! Now I have purchased for my other daughters and their fiances. A very nice surprise gift for my friend. He will be impressed. This is great for the big drinker or for a small bowl. I gave it to my boyfriend and he loves it. And the having his name on it is just that little extra that he thought was great. Bought two and had them monogrammed with my in-law's names. They make great personalized gifts for people who have everything. I bought these around the holidays. These soup mugs are very good. Our names were painted on them and then the soup mugs were fired in a kiln. They will last a long time and our names won't fade. Once my friend used this soup mug for coffee. Does the trick. Love them! I use my cup for Coffee. The color is beautiful, the writing on the cup is beautiful, this cup is way better than I imagine. I bought my daughter one and she loves her cup too. Not too big, not too small. We use it for soups stews and pasta dishes. I have used this soup mug several times and recommend it because it is personalized and holds the perfect amount of soup to keep you warm on a cold winter day. I HAVE ORDERED THESE BEFORE & EVERYONE LOVED THEM..
GREAT FOR CEREALS & SOUPS!! OH.. ALSO ICE CREAM & DESSERTS!!! These mugs are great! I ordered 5 personalized ones last Christmas for my son and his family and this year I ordered one because they had a new baby boy and I just had to have one made for him.Very nice and perfect gift. I ordered two mugs for birthday gifts (last name). When I opened them up I loved them so much I turend around and re-ordered a couple more with last names and also ordered for my grandsons who's first names are hard to find in print! Great size for hot chocolate, soup, or anything you want to be portable to eat! Took advantage of sale prices and free shipping to get some early Christmas shopping done. For a couple of coworkers. MoonBeam and a wacky buddy that will walk up to a gaggle of us girls and say 'Greetin's gals. Name ah Pete'. They will be perfect for heating up canned lunches or the instant oatmeal. I recommended these soup mugs to family & friends. Awesome! High quality, durable, economical, & beautiful personalization. Great gift for a soup lover. Know several soup lovers who will love it. I bought 4 of these years ago and now I am buying more.?? Soup cereal anything, dishwasher safe. Excited to give this personalized gift. I bought 4 of these as a gift. They are perfect! I looked everywhere for a good sized soup mug for the winter. It is 22 oz, which is perfect to me. The customized writing is great, and makes for a cute gift. The price is also great! The mug itself it not too heavy, but has a good thick handle. I was thrilled to find these!! So nice to hold a warm mug of hot soup in your hands after coming in from a freezing cold winter day! This product surely fits the bill. These were 'gifts', they loved it! It wasn't here until after Christmas! But, worth waiting for! GREAT GIFT FOR OTHERS AND YOURSELF! May be advertised for soup but is also excellent for hot cocoa. Highly recommend. Large mug with beautiful monogram on it. His children will use them for all sorts of things such as cereal, ice cream etc. He loved them for the quality and the beautiful personalization. Great dorm gift. The bowls are a nice size for a one dish meal. We have family gatherings and can put up short discription and year on the bowl. I put "Hot Stuff" on one for Valentine's day. Super fast shipping. Affordable personalized gift! I ordered two bowls as Christmas presents for employees [...]Since they were given as gifts I can't comment on the use of the bowls. Excellent prices.Use for hot drinking. Great product. Heavy duty, printing excellent. Good for soup as well as ice cream, big cereal eaters, chili bowl. I love it!! This will be given as a gift. The quality was what I expected. Thank you Walter Drake. I was having an event & I bought 22 personalized 22 oz mugs for all in attendance. Along with the mug, I put a note on a gift bag saying, what will you put in you bowl. I put a can of soup, pack of oatmeal, cracker jacks, etc in the bag. ALL attendees loved the gift. It was cute & purposeful. I'm about to order one more for someone who loved it so much. Of course I ordered mine already. All 22 names were printed perfectly. The ONLY problem I found with this bowl is the fact that it is NOT dishwasher safe. I loved the writing on it! I had a friend coming to visit for several days and I hadn't seen her in 8 years. Anyway... I ordered the soup mug and the coffee mug for her and myself and I was not disappointed one bit. She was surprised to see her name on both mugs! Very pleased with my purchase. Thank you! This item was well received and appreciated. Lettering elegantly done. Great size (tall sides) for no microwave spillovers for oatmeal preparation. Nice off-white color. Good for TV snacks on a tray. Only con was that it wasn't made in the USA. Great and ideal for soup! I absolutely love the mugs I have ordered. The are chic and all the rave. I actually purchased the soup mugs as gifts, along with the 2yr planners, to make sets. I specified the personalization color, to match planner colors...However, I did not get that...I asked for burgundy writing on one, to go with burgundy planner and green writing on the other, to go with the green planner, but unfortunately they both were in burgundy writing, so instead of returning the mug, because, I liked it so much...I opted in ordering another burgundy planner to match, so I can still have a set. However, the personalized name didn't make it. No dishwasher in the home - name began to come off shortly after Christmas 2016. My granddaughters love soup, but these are way too large. Buy for the BIG soup lover on your list! I have bought 10 of these bowls, the last order I made one of the names was misspelled. I repeated the spelling 3 times to make sure the customer service person got it right...It was BRITTNI....It came back to me as Brittany. I had to pay $10.00 to send it back to you to be redone...That was the same amount I had to pay for the product. Now it has cost me double the price...I am very disapointed this has cost me when the mistake was at your end. I will never buy this product again!!!! the lettering is very poor, I have these for my kids and not even 2 weeks the letters are coming out. I wasted my money on these cups. Ordered Dec 10, did not receive item. emailed and was told it was backordered. Would have been nice to have been notified so could get another gift for person for Christmas. Now told it will be here in 7-10 business days--mid january. I purchased more than mugs. I love the quality of the mug for sure. I have given them out for Christmas. I have a few more here but here you will see the issue clearly. I had my name completely was off the mug. I then took stickers and made it over. You see my daughter and her husband's name also peeling off. I am all for the mugs not the material that was used for the names. It seems to nail polish or acrylic paint. There are some nice reviews here and that is nice. But take a look at pictures of the mugs in the days to come. People asked me already who made the mugs. I felt like shi. I was offered $10 but I refused it I wanted a refund and shipping the junk back. I am ok now that it's over. I won't be shopping this store again. A tip that will save your pocket book is before you shop any where check Dollaretreedot com for reviews.